With snowfall already disrupting traffic in Scotland and the North of England it appears that winter has finally started to bite. 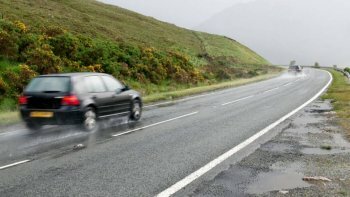 With many motorists holding off on the replacement of worn tyres until the very last minute, there could be quite a few slips and spills on the roads out there. Ensure for winter motoring you have a minimum of 3mm of usable tread left. Any less will be insufficient to allow for safe cold weather braking and water dispersion. Ensure tyre pressures are checked regularly and correctly inflated according to the load you carry. It's officially swap over time! It's November and officially the optimum time to swap onto those winter tyres! Don't be too fooled by some late warm weather either. A prolonged cold snap with possibilities of considerable snowfall has been warned by a number of meteorologists. Temperatures are already tumbling away to low digits. Coupled with the damp and often foggy conditions normal to this time of year and your cold weather tyres are about to pay dividends! Never tried them before? Just the dramatically improved braking distances alone make them worthwhile. When temperatures drop to 7C or below, a cold weather tyre maintains amazing grip through the tread design and compound differences. A 'summer' tyre hardens and low temperatures and significantly loses grip. Not sure? Give us a call to discuss options. We can supply replacement tyres for your existing wheels or supply complete set of alternative winter wheels and tyres from a huge range of styles and sizes. Have them fitted at home with Hometyre and you avoid any additional costs of tyre 'hotels' provided by fixed outlets too. Store your own tyres stacked up in the garage or shed/basement - wherever! Be safe this winter. One of the most harsh winters followed a hot summer and warm autumn back in 2009/2010. We could be heading into the same again! Every now and then we encounter a bit of a jaw dropper in this line of work. From very odd things found stuck in tyres - to very odd things left in car boots too! We also hear things from customers about their experiences at other garages or with other fitting centres. As a tyre retailer, our mobile tyre service units are configured to remove and replace all the types of vehicles we work with - and all the sizes and varieties of wheel/tyre combinations too. It seems this isn't a standard mirrored across the industry though. So a somewhat unorthodox technique that subsequently caused air to leak out where the seal was broken by the paper towels. This process clearly took some time as well since the customer was quite surprised to watch Mark remove and refit another tyre in just a few short minutes without any issues. The customer pointed out that the previous work carried out was cheap. Hometyre are pleased to announce that following a period of detailed assessment, the well respected compare organisation Which? has fully approved all operatives as Trusted Traders! As a consumer you can be assured that our principles and processes have been checked, scrutinised and refined in order to become fully compliant. When you make a purchase with Hometyre you can be relaxed in the understanding that we'll act in the professional and courteous manner as has become expected of any organisation approved by Which? We look forward to welcoming new customers to our dedicated mobile service right across the UK! October 1st 2014 brings a significant change to the way we pay for and display our vehicle Road Fund License! So what are the changes and what do you need to know? You will buy your car tax online and can now pay by Direct Debit either annually, six monthly or on a monthly basis. Provided your payments are kept up to date, your vehicle will remain covered and compliant. You can check the status of yours, or any vehicle, online immediately here. When you sell a vehicle, you can no longer include the Road Fund License. Upon sale, you inform the DVLA of the change of ownership and they will automatically refund to you the value of any full months remaining. When you purchase a vehicle from another person you will be responsible for immediately arranging Road Fund License cover. You can do this by using the New Keeper Supplement part of the vehicle registration certificate (V5C), online , by calling 0300 123 4321, or visiting your nearest Post Office. What does this all mean to me now? So while the government are saving considerable costs in the production and logistics of paper tax discs, they will also be gaining from the obvious cross-over period when vehicles are sold. To be more clear, a vehicle owner who sells on the 10th of a month will likely already have paid for the full month. Once sold, DVLA will only refund any FULL month or months remaining. The remaining weeks will be lost and cannot be carried over to a new vehicle. The new owner, in order to drive the vehicle on a public road will have to immediately pay for the license but this will start from the beginning of that month! In short, the month will be paid for twice. Multiply this by the number of vehicles sold daily and there's quite a revenue stream! It is highly likely that the new system will need to be altered and adapted after a period of time. In the meantime, we think it's all a positive. Road Fund License is necessary to maintain and hopefully improve the condition of our aging and overworked road networks. Drivers who have historically avoided paying are causing good honest individuals more and more each year - while enjoying the benefits of the roads for nothing! The new system will provide and allocate further funding while improving on what should be a level playing field for all motorists! Goodyear Dunlop have proudly announced that two of its high performance products have taken the top two spots in the coveted Auto Express Tyre Test 2014. The Dunlop Sport BluResponse took first place, with the Goodyear EfficientGrip Performance taking a close second. Auto Express tested ten brands of tyre in the size 205/55 R16 with a load index of 91 or 94 and speed rating of V or W. Tests included dry and wet handling, dry and wet braking, wet cornering, straight and curved aquaplaning, rolling resistance and noise. Taking first place, the Dunlop Sport BluResponse performed particularly well in dry and wet braking, straight and curved aquaplaning and rolling resistance. Launched in 2013, the product was positioned to answer the demands of the tyre label without compromising on any of the other 50 criteria tested to create a top performing tyre. Commenting on this, Kim Adams, Auto Express Tyre Tester, said: "....true to Dunlop's launch claims, other performance aspects haven't been ignored, as it was also in the top three on the handling track. "Winning performances in all conditions make this brilliant new tyre our 16-inch champion." He added: "[The Dunlop Sport BluResponse] Champ performs well in wet and dry, yet isn't costly to buy or run." Taking a close second spot, the Goodyear EfficientGrip Performance shone above competitors in many of the test criteria, performing particularly well in rolling resistance, wet handling and braking, wet cornering and cabin noise. Kim Adams said: "Engineers at Goodyear have matched their counterparts Pirelli in managing to create a tyre with good wet grip and strong fuel economy, as the [EfficientGrip] Performance tops our rolling resistance table." He added: "[A] Good all-rounder with few apparent weaknesses, and the best when it comes to economy." Kate Rock, Consumer and Brand PR Manager for Goodyear Dunlop said: "We are thrilled that both of our brands have performed so well in the Auto Express tyre test 2014. By testing this popular tyre size in a wider range of tests than those on the tyre label, we have demonstrated that while these two tyres boast strong label grades, they do not compromise on other important performance criteria. Kim Adams concluded the test commenting: "Going through the results, it's clear Goodyear and Dunlop have worked out how to combine good economy and strong wet grip. But our top two are not one-trick ponies; they are just at home in the dry, so they're worthy of their places." Hometyre supply and fit the eniire range of Goodyear and Dunlop car,4x4 and van tyres at your home or work address. For more information, call us today. 0800783 9310. Time to start thinking about the dreaded winter months? On the roads, apart from those days following prolonged hot and dry spells where rainfall brings out all the greases and oils, generally, grip and overall conditions have been good (we won't discuss pot holes!). This does sometimes lull us into a fall sense of security in terms of our tyres though! An older tyre with very little tread will provide exceptional levels of grip in the dry and heat but quickly turn against you when the weather drops a few degrees and the damp starts to return. Have you taken a closer look at your tyres lately? Do you rely on an MOT or service before they're looked at? Checking your tyres is easy and beyond nobody at all. It's just a simple check that we should all perform with regularity. Do it next time you go to the car! Not sure how? Read through here for simple instructions! September brings not just the potential for an Indian summer but also an early an unexpected/unwanted cold snap too. Countless motorists across the Uk are turning to cold weather tyres each year to provide added safety and surefootedness to their vehicles and travel. Routinely swapping summer type tyres for winter tyres in October used to be a trend exclusive to mainland Europe - now it's become far more popular on our shores too! Contrary to popular belief, you don't need snow or ice present to gain the benefit of these products either. Just colder, wetter weather will highlight massive improvements in braking, cornering and handling abilities. Once converted, we note that drivers will almost refuse to drive during the winter months on anything less! Find out more here or call us for more information and advice! Be safe this autumn and winter. The highly acclaimed Ultra-High-Performance tyre (UHP), the Avon ZZ5 has achieved the ultimate EU regulation award for wet grip - an A-grade! Through successful development and innovation in its compound, the global manufacturer has placed its product amongst an elite few! The ZZ5 has a directional tread design with an emphasis on high speed water dispersion through its silica formula. Hometyre supply and fit a full range of Avon tyres including the new ZZ5. Call now for more information or book online for tyre replacement. Global tyre giant Goodyear/Dunlop recently won Which? 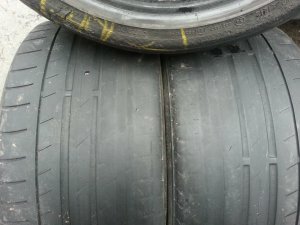 Best Buy recommendations for its Goodyear EfficientGrip Performance and Dunlop Sport BluResponse tyres in size 195/65 R15 V.
The Goodyear EfficientGrip Performance was one of the most highly rated tyres, with its wet handling, dry and wet braking and fuel economy in particular receiving commendations. 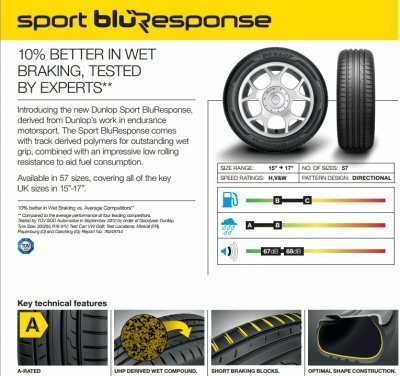 The Dunlop Sport BluResponse achieved plaudits for its wet and dry handling, fuel economy and particularly braking in the dry, stopping a full 7.5m before the worst tyre in the test!! Across the full range of sizes, you'll see that the brands rank particularly well in terms of the new European tyre label. Looking for new tyres? Check out all products online with Hometyre. The highly anticipated new SUV from Porsche - the MACAN will be fitted as standard with ContiSportContact tyres. The German sports car manufacturer has selected its homegrown counterpart to provide these vehicles with the optimum safety, high speed driving reliability and surefooted grip for fast braking. Fitted with two varieties of summer style tyres in both 18" and 21" fitments, the MACAN will use the ContiSportContact 5P N0 in both 265/40R21 101Y and 295/35R21 103Y in the larger sizes. Owing to its superior handling characteristics and driver stability systems, for winter use, the cars will be supplied with the ContiWinterContactTS 830 range to ensure higher speed performances even during the coldest spells! These will be fitted in the slightly more manageable 235/60R18 103V & 255/55R18 105W sizes. You'd really need to own the type of car worthy of a tyre of this calibre - otherwise it'd be a bit of a waste - but for the road and track going type of motorist, the new MICHELIN PILOT SPORT CUP2 is something else! Now offering up to a 50% longevity improvement on track (not to mention the potential for faster lap times) than its predecessor the PILOT SPORT CUP+, the new product is once again a road legal ultra-high performance monster of a tyre. Fitted as original equipment to some of the worlds most incredible cars including the Mercedes SLS AMG Black and the Ferrari 458 Speciale, this tyre has even had a completely new development created for it to make it more distinguishable visually too! Michelin Velvet Technology® was created to use light absorbing techniques in order to enhance images and information on the sidewall! Flash or what! Described here by Michelin: "Perfectly synchronised to the demands of the best sports cars. Lower rolling resistance for better fuel consumption.Road legal reduced tread depth tyre for road and track use.Fitted as original equipment to Porsche 911, GT2, GT3 and the BMW M3Dual tread compounds. Motorsport outer compound for outstanding dry grip, "full silica" inner compound to optimise wet grip. Road legal reduced tread depth tyre for road and track use.Fitted as original equipment to Porsche 911, GT2, GT3 and the BMW M3.Dual tread compounds. Motorsport outer compound for outstanding dry grip, "full silica" inner compound to optimise wet grip. Tyre giant Goodyear Dunlop have announced a breakthrough in microchip technology for car and tyre development. Utilising a chip embedded into a tyre and information relayed real time back to the cars onboard computer, it is now possible to use accurate live information relating to tyre temperature, pressure and performance in order to vastly improve driver awareness and safety. The battery-less system sends data that enables the cars central computer system to automatically refine control algorithms according to the dynamic changes occurring within the tyre throughout the course of every journey. It is stated that improved braking distances, corner control and all round driveability will be felt. The system has been tested using the leading Dunlop SportMaxx RT range of tyres and distribution into the marketplace will be announced shortly. Goodyear TV campaign "Made to Feel Good"
Tomorrow night (Tuesday 8th April) will see the prime time TV appearance of Goodyear tyres once again. Showcasing the highly acclaimed Goodyear EfficientGrip Performance product range, the global tyre giant will be focusing consumers attention on driving enjoyment and weather conditions in the UK. The EfficientGrip Perfomance range of tyres offer some of the highest ratings within the new EU tyre labelling legislation too. Denoted by alphabetic rankings between A and G (A being the best!) measuring both wet braking capabilities and rolling resistance (fuel economy) the tyres return B and A ratings while also producing low noise emissions. Hometyre offer the full range of Goodyear Efficient Grip tyres such as the ever popular 205/55H16. Looking for new tyres for your vehicle? Call us for availability of the EfficientGrip Performance range now on 08007839310. The first F1™ race of 2014 kicked off in Melbourne and, despite huge changes to both the cars, qualifying and the usual driver merry-go-round, for the first time in memory, the tyres barely got a mention! 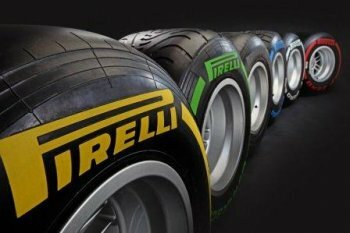 Unlike previous seasons where the sports supplier, Pirelli, came under intense scrutiny following a succession of failures and ongoing driver criticism concerning reliability, this year everything appears to be very much more straightforward for the Italian tyre giant. This year, the much revised engine and battery boost systems will be the cause of much debate and heartache for both teams and drivers alike. For 2014 all teams will once again use the highly acclaimed and fully revised PIRELLI PZERO™ CINTURATO™ F1 tyres. The season ahead, if the first race is anything to go by, promises to allow for more overtaking, less reliability and different race winners taking the top spot on the podium. Not sure what all the varieties of tyres and their respective colour banding means? Here's the info directly from the manufacturer! Dry weather tyres, known as slicks, are characterised by a tread pattern that is devoid of blocks or channels. They come in four compounds: supersoft, soft, medium and hard. The different compounds mean that the tyres are well suited to a wide variety of circuits, according to the type of asphalt, the number and severity of the corners, and the top speed on the straights. This allows the teams to make use of an ample range of strategies. For each track, Pirelli - in accordance with the FIA - nominates the two dry compounds best suited to the tracks characteristics and the temperature to be expected. P Zero™ Red Supersoft. The softest compound in the range is ideal for slow and twisty circuits, especially in cold weather, when maximum mechanical grip is needed. The supersoft benefits from an extremely rapid warm-up time, which makes it ideal in qualifying as well, but the flip side to that important characteristic is of course increased degradation. This is a low working range compound. One of the key evolutions this year has been optimisation of the footprint pressure and temperature distribution. This presents a more even contact with the asphalt, improving grip and handling. P Zero™ Yellow Soft This is one of the most frequently-used tyres in the range, striking a very good balance between performance and durability, with the accent on performance. It is still biased towards speed rather than long distances, but is nonetheless capable of providing teams with a competitive advantage both at the beginning of the race on full fuel and when used as a 'sprint' tyre at the end. This is a high working range compound. P Zero™ Orange Hard. The toughest tyre in Pirelli's range is designed for the circuits that put the highest energy loadings through the tyres, with fast corners or abrasive surfaces, and are often characterised by high ambient temperatures. The compound takes longer to warm up, but offers maximum durability - which frequently means that it plays a key role in race strategy. This is a high working range compound. Cinturato™ Green Intermediate. The intermediates are the most versatile of the rain tyres, dispersing approximately 25 litres of water per second at full speed. They can be used on a wet as well as a drying track. This is the only tyre that has not changed compared to last year. Cinturato™ Blue Wet. The full wet tyres can disperse up to 65 litres of water per second at full speed (increased from 60 litres last year), making them the most effective solution for heavy rain. The latest evolution of the Cinturato Blue means that it is also effective on a drying track, with increased durability. The full wet tyre has a new compound and a redesigned rear tread pattern to further reduce aquaplaning. The result of this intensive work is increased driveability in a wide variety of conditions. Friday the 7th March sees our team spending the day on site at Sainsbury's super store, Crawley offering a free tyre safety clinic and pressure checks. For over five years now, Hometyre have regularly provided these days at select Sainsbury's stores the length and breadth of the country. Patrons of the stores are able to drive between our mobile units and have all tyres checked and pressures adjusted. This is a no obligation safety service offered in conjunction with Sainsbury's. If you're in the area - drop by - we'll look forward to seeing you! Tyre concerns to force new F1™ qualifying rules? In a bid to ensure that viewing audiences are not left disillusioned with F1™ qualifying, the sports governing body has convened a meeting with team principles for February 21st. The move has been prompted by a recent F1™ Strategy Group meeting where it was highlighted that drivers may choose not to run in the third and final grid positioning qualifying run. The current rules dictate that top ten drivers must use the same tyres to start the race that they completed their best Q3 time on. This has, in past races given certain drivers the 'benefit' of starting a race on a preferred choice and potentially gaining race positions and potential points accordingly. As a spectacle however, this has lead to considerable disappointment amongst fans. Forcing Q3 drivers to start the race on those they used to set their best lap during Q2. Q3 drivers to be supplied tyres specifically and only for use during the final period - then have them returned to the FIA. The latter would surely provide the most entertainment with all teams and drivers pushing the car and tyres to the limits. Any such changes will need the unanimous support and approval from all teams in order to implement it before the season opener in Australia on March 16th. While winter hasn't yet imposed it's full potential on us all, you may well already be starting to consider the spring and summer season ahead? Caravans and motorhomes typically remain dormant and static for five or six months from October through to March. It's during this period that potential issues will start to arise and cause you problems at time of next use. It is vitally important to have you vehicle properly checked over before recommissioning. After all, you don't really want to spend the first six hours of your long awaited holiday camped up on a hard shoulder - or worse! Early preparation is the key! 1. Even after taking time and care to prevent ingress of damp into your vehicle, this can still occur. It's always best that soft furnishings are removed during prolonged storage but if that isn't possible, check all items thoroughly for signs of mould or mildew - this could lead to a source of a leak or run off area for condensation. A good wash and proper drying out of the vehicle should get it all fresh! 2. Check window seals for a build up of moss or mould. These often retain moisture and will quickly bloom when left unattended. Clean back all the seals on both faces and use a mould/mildew remover to get stubborn marks off. This will also help create a better seal for the colder evenings out and about! 3. You should really call upon the services of a reputable mobile caravan/motorhome service mechanic. These guys know what to look for and what to pay particular attention to to maximise your safety. If you use gas - which most do - a Corghi approved technician would be preferable to cover all the bases. Water pipes, gas pipes and heater units can all be covered at the same time as well as ensuring the vehicle is properly ventilated! Braking systems and wheel bearings should both be in perfect working order - as should the towing mechanism. While a good DIY mechanic can check these items, it's always best to use a professional! 4. Ensure your tyres are up to the job! Good tread is not an indication as to the tyres suitability or condition. Rubber is a natural product and ages from the moment it was manufactured. Ideally, a tyre should be replaced at six years of age - regardless of use or mileage. Prolonged periods remaining static - especially outdoors - can have a dramatic effect on a tyre. Bleaching from the sun can cause extensive perishing of the sidewalls and tread area and the tyre can literally change shape from round to a 'D' shape having sat in one position for months on end. Did you know a tyre has a date of manufacture stamped onto the sidewall? Read here for more info. 6. Don't forget to check your towing vehicle too (for caravanners). No point going through all the necessary precautions and preparations if the vehicle you are towing with is unprepared. 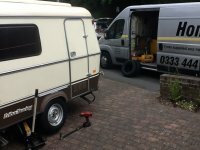 Towing a caravan adds considerable strain on engiine/suspension/brakes/drivetrain and tyres. Any fault or failure on any of these components could have very serious consequences. Ideally try and tie in a full annual service on your towing vehicle just before the holiday season begins - this will avoid further costs! Ensure your tyres are also in good condition - not too old - and that the best ones are fitted to the rear too! Inflate them to the correct setting and don't forget to lower them back down again when your towing is completed for a duration of time. Many of the incidents and accidents involving leisure vehicles are a direct result of poor maintenance and preparation. It really is worth your time and safety to get it right before you turn a wheel! Could this be and become a common problem? These tyres were replaced today on a customers vehicle. The car is a 2012 Mercedes CLK with 30k miles on the clock. The gentleman was unsure how to check his tyres properly but recognised that some of the bulges on the front tyres were perhaps cause for concern. The problem facing many motorists now seems to give rise to this worrying trend of vehicles running on seriously worn/damaged tyres. 1. Service intervals on modern vehicles due to developments within components durability and oil technology have increased to over 30,000 miles in some instances. 2. Traction control, ESP and intelligent braking systems, coupled with vastly improved internal noise transmission mean that drivers are less aware when tyres have gone way past the usable and safe window of operation. 3. New vehicles only require an Mot after three years. These annual checks for many motorists often represent the only time in a calender year that tyres are properly inspected. 4. Wide tyres on low slung vehicles are often very difficult to properly inspect for many motorists. The nature of the suspension set up of many modern vehicles to improve cornering means that inner sections of tyres often wear away much more rapdily than the outer. 5. People are busy making a living to pays bills and often simply overlook something which can often feel fairly trivial but can be a very real killer. Those that have had lives lost or forever altered would always wish for the chance to do it differently a second time round. This particular driver was obviously quite shocked to see the extent of the wear and damage and very relieved not to have suffered as a result - certainly given the wet of late. A series of reasons had occurred as to why these tyres were allowed to go this far. The scare should prevent this happening again for this driver though. Folks, the message may be coming from a tyre retailer so some may just disregard this - but if this scenario sounds familiar to you or someone you know, just take a few minutes to look into it! Wherever you get them replaced and whoever by, it's simply not worth the risk to leave them to chance! A great big thank you to all of our customers across the UK for a great 2013. We wish everyone a prosperous and safe 2014 and look forward to serving you again in the future. 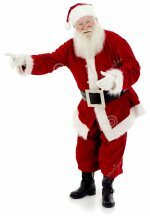 We'd like to wish all of our customers and service providers a very happy and safe Christmas! If you're driving home or away anywhere this year, please take a couple of minutes while it's bright and mild outside to cast a careful eye over your tyres. Remember: the legal tread requirement is 1.6mm but at this time of year you don't really want to be driving with depths much below 3mm! Always check the very inside edge of all your tyres too - these areas are often worn the worst. Not sure how to check or what you're looking for? Check our tyre inspection guide here, or call us for free, no obligation help! While we're experiencing unseasonably mild weather during December, bear in mind this can change very quickly. 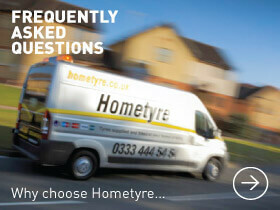 With Hometyre, we supply AND fit your new tyres directly at your door! 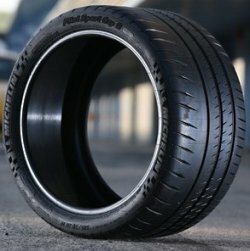 Don't be fooled by cheap websites that just deliver tyres to your door!